2018 was the Year of Young People in Scotland, a year to show Scotland’s young people how important, and valued they are, and how proud we are of them. We worked with four fantastic young people from across Scotland to help put together the 2018 Fringe Central Events Programme, a series of free events aimed at Fringe participants which facilitates artistic and professional development and addresses a range of issues including accessibility, diversity and equality. Between November 2017 and March 2018, the Fringe Society invited arts organisations and professionals to submit potential event ideas for inclusion in the 2018 Fringe Central Events Programme. The Fringe Central Youth Panel’s contribution was invaluable, providing feedback on every event submitted, suggesting new collaborations, and giving Fringe staff lots to think about. We had a chat with two of our panel, Liv Ancell and Myfanwy Morgan, to find out why they got involved and what they think about the Fringe. What is it you like about the Fringe? Liv – "The Fringe has always been a part of my life growing up –I don't remember a time when I didn't know about it! My parents took me along to some of the child-friendly interactive shows and events when I was little, which I absolutely loved." "The Fringe is so accepting and all-encompassing – it's an inclusive platform for any voice, no matter how experienced or mainstream the act or performer is. I love that you get such a wacky assortment of performances at the Fringe, from free gigs to world renowned acts, and sometimes you never know quite what you're going to get. It really brings the city alive for the month of August. It's thrilling to be a part of it!" Myfanwy – "It's inclusive, unique and inspiring. People from all over the world enjoying theatre from all over the world. Also getting to enjoy Scotland’s wonderful personality, shortbread, drinks and our thriving theatre culture." Why did you get involved in the Youth Panel? Liv – "It’s an amazing opportunity to be a part of the Fringe team, have my voice heard, and gain extra experience in events and marketing." Myfanwy – "I wanted to give my perspectives on how the Fringe can improve for its younger audiences and to work on the accessibility work that has already been started. I heard about the youth panel through another youth organisation I’ve worked with called Highland Youth Arts Hub. Get involved with as much as you can in your home area and you never know where it can lead you." Liv – "One year when I was about 13 I spent £200 of my hard-earned dog walking money on tickets to see well known comedians, from John Bishop to Kevin Bridges. It was the first year that I was allowed to go alone with my friends, which was so exciting! I got to see Jack Whitehall in his very early days at the Pleasance, in a packed-out room of... 15 people. It's amazing to be able to see world class comedians at the very beginning of their journeys." Myfanwy – "I honestly cannot say I remember my first Fringe show. When you go to the Fringe you always try and push in as many shows in as possible… my record is 48 in one Fringe. My favourite show was finally seeing a hilarious, frizzy haired goddess from Australia called Felicity Ward. I’d watched her YouTube videos for so long and finally got to see her." The Fringe Society is working with Youth Theatre Arts Scotland to nurture and support the next generation of arts critics, through the 2018 Young Critics’ Programme. This programme brought ten young writers through a series of workshops and exercises, exploring a range of topics including the fundamentals of arts criticism and finding a voice as a critic. During the Fringe, the Young Critics reviewed shows and received feedback on their work from leading arts journalists to progress their writing skills, with support from the Fringe Media Office. The Fringe Young Writers’ Award, open to young people aged 16 to 21, was given for the best review of a 2018 Edinburgh Festival Fringe show by a young writer. The winner of the award receives mentoring from arts writers at The Scotsman and paid work as part of the paper’s review team at the 2019 Fringe. Award applicants were asked to submit a review of any 2018 Fringe show for entries to be considered by a panel of judges, made up of leading arts journalists. There are many opportunities for professional development at the Fringe and we are using the Year of Young People as a springboard to extend these opportunities to young people who want to explore a career in the performing arts. If you are interested in this opportunity or know someone who would be, please contact Robyn Jancovich-Brown for more details. We are working with arts organisations around the UK, to bring young arts programmers, aged 16 and over, to the Fringe, so they can see work which could be booked for their venues. We’ll be updating here on our young programmers and their experiences. The annual Edinburgh Festival Fringe Schools Poster Competition is a key feature of the Fringe Society’s programme of activity for Scotland’s Year of Young People. The competition introduces children to all that the festival has to offer, encouraging the next generation of Fringe performers and arts professionals. 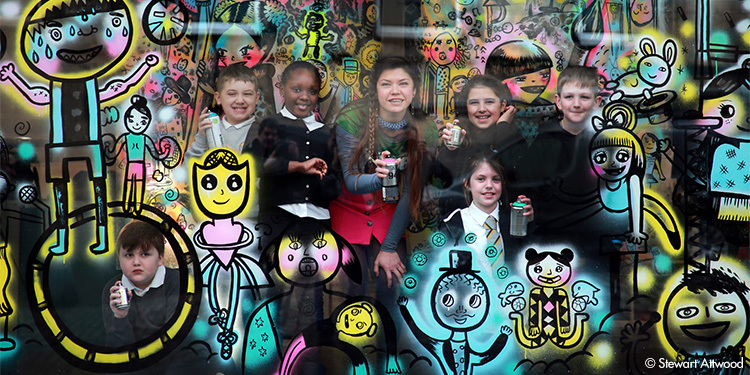 To celebrate the competition and the Year of Young People, Granton Primary School and champion artist Ursula Kam-Ling Cheng created a Fringe inspired artwork in the window of the Fringe Shop on Edinburgh’s Royal Mile.